Ian and I took a catamaran trip to the Bay of Islands today. The sky was blue and the water looked like a mirror as the sun shone on to the still waters. As the name suggests, this bay is filled with islands - some significant, some just mere rocks poking out of the surface of the water. Twenty minutes into the journey, the skipper announced that one of the local fishermen had spotted some dolphins in Oke Bay and had radioed this information through. Fifteen minutes later we arrived at the bay and watched another tourist boat leaving the vicinity. We were told that we could swim with the dolphins if they did not have a calf or juvenile with them (this is because the mother can get overly protective with her young). I looked over at the other boat and could see that the passengers had dry hair - perhaps we were not in luck after all. Before I could ponder any further, the skipper confirmed that he'd spotted a juvenile in the pod and that we were not going to be swimming with them on this occasion. As we arrived, I could see 25 to 30 dolphins swimming together. It was a fantastic sight, as I have not seen so many at one time. Some of them were showing off by propelling themselves in to the air and landing with a huge splash. Some were happy just to do small semi circles in and out of the water. Others swam close to the boat, occasionally breaking the surface to blow water out of their blowholes. These dolphins seemed as intrigued by us as we were of them. 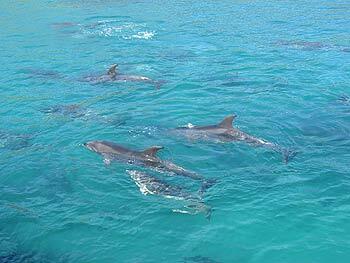 They swam playfully by the boat, eager to keep our attention. The dolphin pod - about 30 in total. As the boat left the bay, they came swimming as fast as they could to try to keep up. They jumped out of the water more often as if to say 'I'm still here!' This provided another good opportunity for the photographers amongst the group to take more photos. Despite not being able to swim with them, we were happy that we'd at least seen some. Dolphins jumping in the air as we leave the bay. 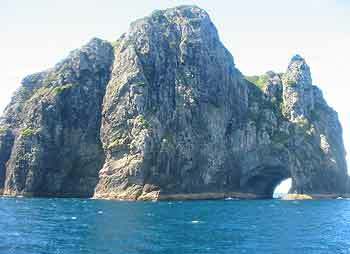 The catamaran then took us to the 'Hole in the Rock' and the adjoining 'Cathedral Cave'. Both formed as a result of erosion over the years. Apparently, loose rocks still fall down from the top of the cave in the 'Hole in the Rock'. A few people instinctively put their hands over their heads upon learning this fact. Somehow I think this cave is safe enough - they wouldn't sail the boat through otherwise. The 'Hole in the Rock'. From this rock, we could see the lighthouse on Cape Brett. Slightly further up, we could see the 'Bird Rock'. So named as a result of birds, mainly sea gulls, perched on the rock. Oh, and one fat seal berthed on one of the adjoining jagged rocks. Not sure what he was doing there but he sure looked out of place! The skipper commented that this was the only place that had 'tropical snow'. It took me a few seconds to register the joke! I put the delay down to the fact that my sea legs aren't particularly strong! 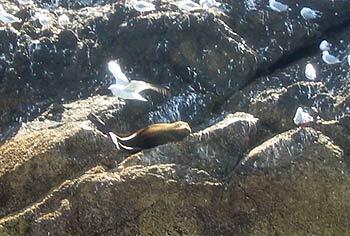 A solitary seal lazes around among the seagulls on bird island. We stopped off at Urapukapuka Island for lunch (Jamie Oliver's favourite island?). Most of us brought some packed lunch and sat on the beach, eating our food. A few braved the cool waters and went in for a dip. Ian was one of the brave ones. He went snorkelling and saw nothing except for silt, more silt, a starfish and then ... a huge manta ray. The manta ray was camouflaged amongst the silt on the seabed. Ian, unaware by its presence, dived near the bottom and must have disturbed the thing. Next minute, the manta ray took off quickly, startling Ian as much as it must have been startled itself. Once Ian realised it was a manta ray, he tried to follow it but the manta ray was too quick and got away. We arrived back at Paihia early in the evening. Despite not being able to swim with the dolphins, everyone on the boat seemed content that they had at least spotted some. Thirty dolphins is a lot to see in one go, and after spotting that pod, no other boat reported any further sightings during the day, so we were very lucky. Actually, given how cold the water was today, perhaps it was lucky that we were prevented from swimming with them too - that's one way of putting a positive spin on it!